I don’t know about you, but I absolutely love apple pie. Apple pie in any form – slab pie, galette, Dutch-style, traditional double-crust… if it has the words apple and pie in the name, I will devour it. Last year, I made a Salted Caramel Apple Cheesecake Pie, which totally blew my mind. I’ll eat cheesecake without abandon, but the combination of the apples with the salted caramel was absolutely superb. I knew that at some point I wanted to try a more traditional apple pie with the infusion of a salted caramel sauce. It finally happened, and I couldn’t have been happier with the results. A melt-in-your-mouth butter crust and paper-thin apple sliced layered with a homemade salted caramel sauce is dessert nirvana. I was asked by multiple people how I did the cut-outs on the crust. I used a double-sided pie topper that I purchased from King Arthur Flour, which basically acts as a stencil press. While they currently have a heart and lattice and model, it doesn’t appear that they are still selling the one that I used for this pie – the “autumn” version. Perhaps it is just temporarily out of stock, and they’ll begin carrying it again. In the event that they don’t, the lattice version is beautiful as well! I don’t make a ton of pies throughout the year, but each time I make one, I tell myself that I need to make more pies. There’s just something about making homemade dough, rolling it out, meticulously pinching and crimping the edges, and oh, that smell. The wonderful smell that emanates from a kitchen that has a fresh pie baking in it… there’s little that can compete with that fabulous aroma. Now imagine a fresh-baked pie with salted caramel. You’ll be standing in front of the oven salivating, I promise you. I love how thinly sliced these apples are (I used a mandoline); it’s perfect for piling high and infusing with the salted caramel sauce. When the pie comes out of the oven, that sauce is bubbling and beautiful and smells amazing. Once it cools, it sets up beautifully, with a little bit of caramel sauce seeping out of each piece when it’s plated. Pass the vanilla ice cream, please. Seriously, I really need to make more pies. 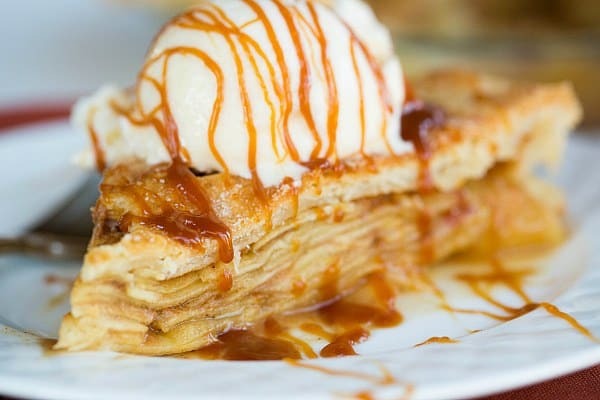 A traditional apple pie gets a spin when thinly sliced apples are layered with salted caramel sauce. Make the Dough: Put the flour, sugar and salt in the processor bowl of a food processor and pulse once or twice to combine. Add the butter and continue to pulse until the mixture resembles coarse crumbs. Slowly add ¼ cup of water as you continue to pulse, adding more water a tablespoon at a time if necessary; stop pulsing when the dough just starts to come together. Remove the dough from the food processor and form into 2 disks. Wrap each one in plastic wrap and refrigerate for at least 2 hours, or up to 3 days. The dough can also be frozen for up to 2 months and thawed in the refrigerator. Remove one disk of dough from the refrigerator and place on a lightly floured surface. Roll the dough out into a 13-inch circle. Transfer the dough to a 9-inch pie plate, and gently press the dough into the bottom of the pan and against the sides. Leave the overhanging dough in place and refrigerate for at least 30 minutes, or until completely chilled and firm. Remove the second disk of dough and roll out into a 13-inch circle. Use cookie cutters to cut out shapes in the dough, or make a lattice-top (see instructions here). If using cut-outs, trim the circle to 12 inches, transfer to a parchment-lined baking sheet and refrigerate for at least 30 minutes. Prepare the Filling: In a large bowl, toss the apple slices with the lemon juice, then drain in a colander. In a medium bowl, whisk together the sugar, flour, cinnamon, allspice and nutmeg. Return the apple slices to the large bowl, add the sugar mixture and toss to combine. Assemble the Pie: Remove the dough-lined pie plate from the refrigerator. 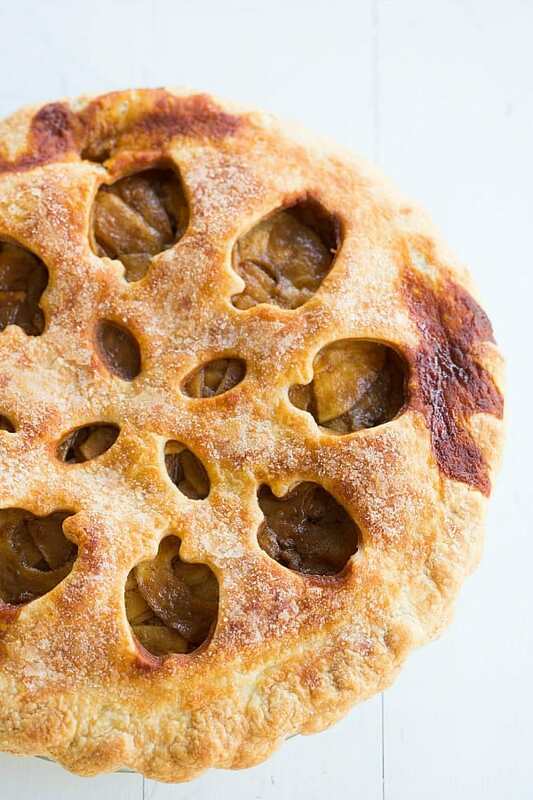 Use a slotted spoon to remove one-third of the apple mixture from the bowl and layer in the bottom of the crust so there are hardly any gaps. 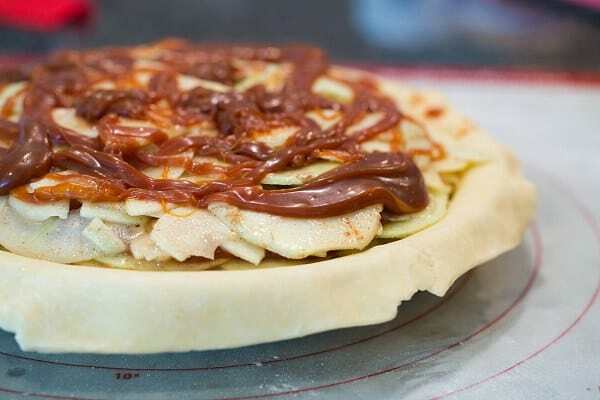 Top with one-third of the salted caramel sauce, then repeat twice more with layers of apples and salted caramel sauce. Top the pie with either the cut-out dough round (or lattice-top) and trim the edges of the dough a ½-inch over the edges of the pie plate. Crimp the edges of the pie and then place in the freezer for 30 minutes before baking. 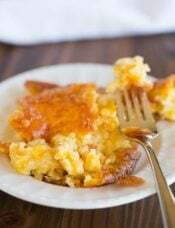 Bake the Pie: While the pie is chilling, place a rimmed baking sheet on the center rack of the oven and preheat to 350 degrees F.
When ready to bake, brush the top of the pie with the egg wash and sprinkle with the sugar. 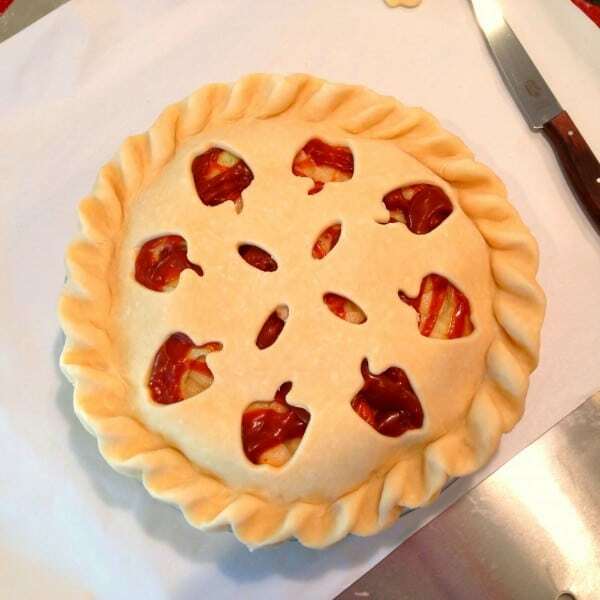 Place the pie on the baking sheet in the oven and bake for 30 minutes, or until the edges of the crust start to brown. Remove the pie from the oven and cover the edges of the crust with a pie ring. 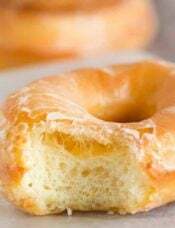 Continue to bake for an additional 25 to 30 minutes, until the crust is golden brown. Remove the pie ring and continue to bake for an additional 5 minutes if the edges of the crust are a little pale compared to the rest of the crust. Transfer the pie to a wire rack and allow to cool completely before serving. The pie can be kept, covered, at room temperature or in the refrigerator for up to 2 days. Wonderful pie! Husband said it was the best or he’s ever had. Lots of caramel left over to use for a cake. Great, easy recipe. Used a mandolin to slice the apples. I made the pie for Thanksgiving dinner, today (Wednesday). All the caramel melted out of it onto my cookie sheet I thankfully had it on. I followed the recipe exactly EXCEPT I put some caramel on the bottom of the crust to keep it from getting soggy! I don’t know how it turned out yet but I’ll update this after dinner tomorrow after the big meal if I can move!! I wish I knew what I did wrong. I made this for thanksgiving it was amazing! My only issues was it was a bit runny/watery. Maybe i should have added some more flour to the apples or cornstarch? 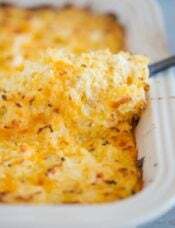 I made this for Thanksgiving dinner and it was a HUGE hit! I made a lattice top crust and the caramel bubbled up a little but it was delicious. I will definitely make this again! I made this pie last year and it was a hit. Even my husband who does not love pie really liked it. I signed up to make 17 mini pies for all the bus drivers at our school. Do you think this would work for mini pies? Not sure how if I would have to double or triple this recipe. Any feedback would be great. Hi Christie, I’m so glad you liked the pie! 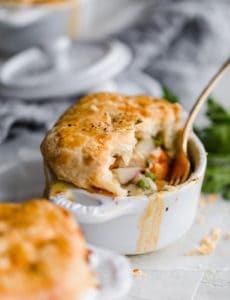 I have never made mini pies, so unfortunately I couldn’t give you any concrete advice :( If you try it, definitely let me know how it works out! This looks amazing! I don’t have a candy thermometer and am a little intimidated to make the salted caramel sauce from scratch. Would a can of dulce de leche work instead (even if it is a slight cheat!)? Hi Renee, Yes, you could totally cheat with dulce de leche, that would be delicious! This recipe sounds amazing, and I will be making it next Thursday for a potluck at work. Any idea if precooking the apples (a la Cook’s illustrated in the microwave for a few minutes) is necessary in maintaining a good texture and avoiding the dreaded “gap” between the crust and filling? Also, did you find that your layer of caramel on the top tended to bubble and spit out of the cute cutouts in your top crust? Hi Autumn, This pie did have a little bit of a gap between the top crust and the filling, but I haven’t tried the Cook’s Illustrated microwave trick you mentioned. The layer did not spit out the top, it kind of soaked into the filling. I made this today for a Saturday even treat and it was amazing!!! Although I love baking I’ve only ever made one pie (for some reason they’re just not that big a thing in Australia!) and this morning I woke up knowing there were apples in the fridge needing to be used and rather than my first thought of apple & cinnamon muffins, I felt the urge to bake a pie… googled a recipe and opened yours up first and I’m glad I did! I made a full batch of the caramel sauce and I’m very excited for the remainder of that, too. Thanks for the great recipe, now off to continue my avid saving of all your other delicious sounding treats! Hi, does the dough not have to be pre-baked with baking beans? I made a pie recently where it didn’t require a pre-baked pastry and it tasted raw afterwards? Hi Claire, No, double crusted pies typically do not have the bottom crust blind baked. This pie, right here, was beyond good. I did not make the dough but used a refrigerated one called ‘Immaculate’ which I find mimics homemade pretty well. Any who, this was super easy to put together but that salted caramel sauce. Oh. My. Goodness. I have been eating the extra with a spoon right out of the refrigerator! I will totally make this pie again if only to hear my husband rave about this being the best apple pie he’s ever eaten. Thanks!! I made this today, as a model for my students taking on a variety of Genius Hour passion projects. I failed EPICALLY. She really does mean 3-4 hours of cooling time. Thirty minutes let me have pie (mush) early, but I wish I had waited longer. The flavor was spot on, and I liked the crust. I have NEVER made a scratch pie before, so failure was good. :) I will try again. Made this for Thanksgiving. I can’t thank you enough! It looks and smells divine and was really fun to make. Whipping up the homemade caramel and using the mandoline for the apples really made this a special pie. And my fear of homemade dough is no more! Your method was simple and came out perfect. Thanks and happy holiday! What happens if the eggwash and sugar are forgotten? It will turn out fine, but the crust won’t have a golden shine to it. I just made this for my government class. We’re modeling the primary process by using pies, so then it’s a pie-mary haha (: thanks for the wonderful recipe! You didn’t peel the apples? 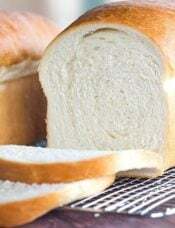 What did the skin bake up like? 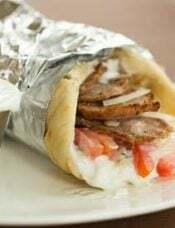 Looks delish. am trying it now but peeling the apples. Maggie, They are peeled, you’ll see in the list of ingredients that the apples are peeled, cored and thinly sliced. This looks amazing! 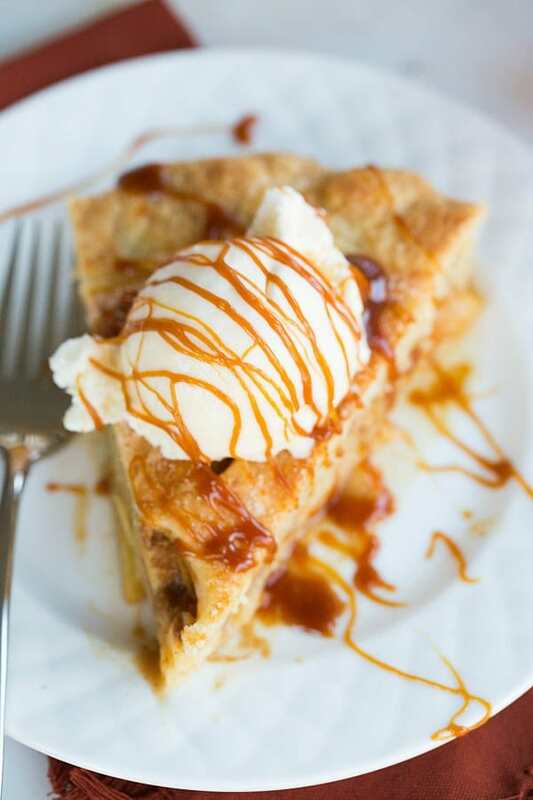 I’m posting Caramel Apple Pie on my blog tomorrow too :). The recipes are quite similar except mine has caramel baked on top of the crust too. That’s my favorite part of the pie – it’s wonderful! I’m going to be completely honest. I found your website while searching for a dog-friendly birthday cake for my pup. I subscribed after perusing your site (and noticed the Primanti Bro’s and Strip District references) and am so glad I did. I grew up just outside of Pittsburgh and now live in the Rocky Mountains. I made this gorgeous pie for an office dessert bake-off and won second place (only because I only took one pie and ran out before everyone got through the line). 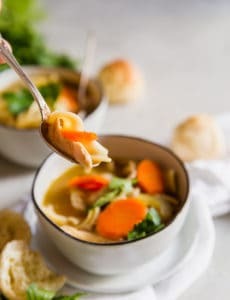 I had numerous people come up and ask for the recipe and I was happy to share your site. The pie was a huge hit!! I’ll be making this again for Thanksgiving in a few days. My boys will love it!!! Thanks so much. 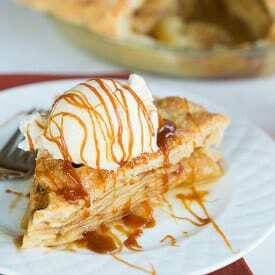 This pie is awesome made it and the caramel sauce. Also super appreciate the lattice pie top instructions I have never had a lattice look so good! 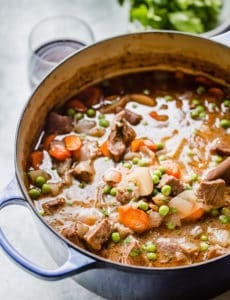 awesome recipe I will be using over and over and by product my house smells delicious. I can’t wait to make this pie! It looks amazing! I am not a big allspice and nutmeg fan. Do you really taste them in the pie? Can I leave them out of just use less? Thanks! I meant “or” just use less. Thanks! Hi Yvette, You really can’t taste them, I would just use the amount called for. 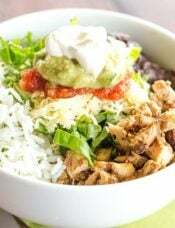 They do help to balance the flavors without being overwhelming on their own. 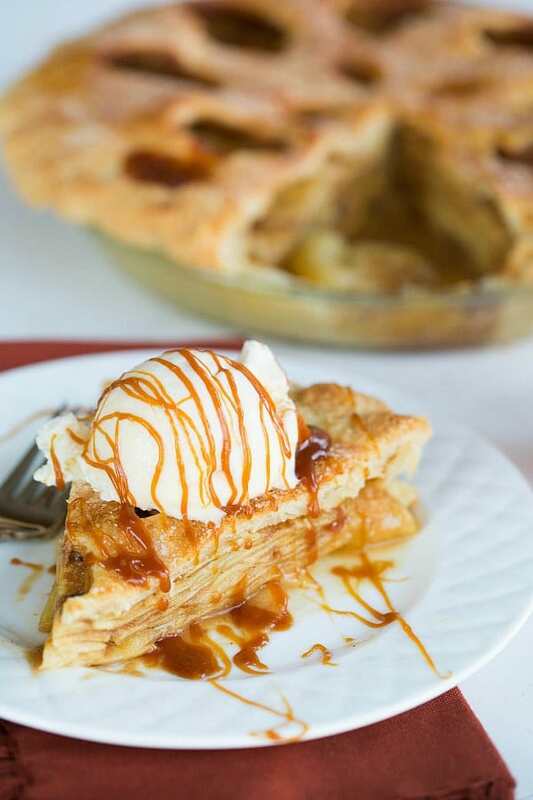 Yummy, apple pie is my favorite….And always looks for new and fresh recipes…Thanks for sharing.